Hello. My name is Dr. Rajy Rouweyha. I'm with Nevada Eye Physicians and this is cataract awareness month and this is episode number two. The question is how are cataracts detected? In reality, cataracts are detected by you, the patient. That sounds easier said than done. What happens is you're gonna know the symptoms that are like loss of vision, or decreased vision, or changes in vision, glare, halo, so on. That's gonna cause you to come in, and when you come and see us, we're gonna use a machine similar to the one that's over here that's gonna allow us to look at your eye. After we dilate you, we're gonna look at the natural lens. Basically, what we're looking for is a natural clouding of the lens. A clouding of the lens is actually what's known as a cataract formation, so that's how we detect cataracts. For more information, please be sure to see a Nevada Eye Physicians' doctor and we'll be happy to assist you further. 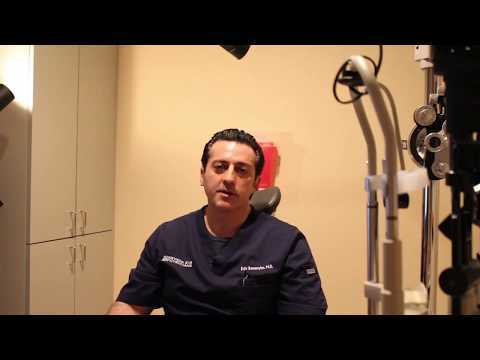 For more information about cataracts, or to schedule an appointment with Dr. Rouweyha, call us today at (702) 456-4000.